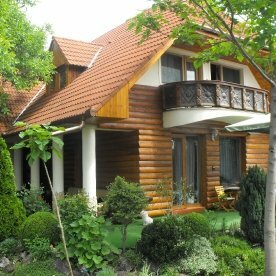 Holiday-house for 10 persons with 5 bedrooms and furniture in Vonyarcvashegy, about 500 meter from the lake Balaton. On the ground floor: hall, 2 bedrooms (both with 2 beds), bathroom (with toilet), dining-room lounge, kitchen (with equipment), roofed teracce of 16 m2 (with furniture). 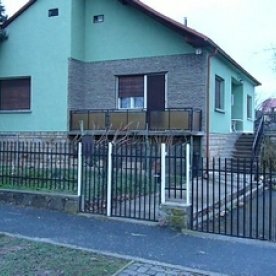 On the first floor: 3 bedrooms (all with 2 beds and balcony), 2 bathrooms (with toilets), lounge. A well-looked-after garden also belongs to the house. Car parking places (max 3) are in the garden. Shopping possibility about 400, restaurant 100 meters away from the house. Pets are allowed (max 2). Minimum duration of stay: 3 nights. Our prices do not contain the Tax (400 HUF/person/night over the age of 18 ).